This course has been updated! 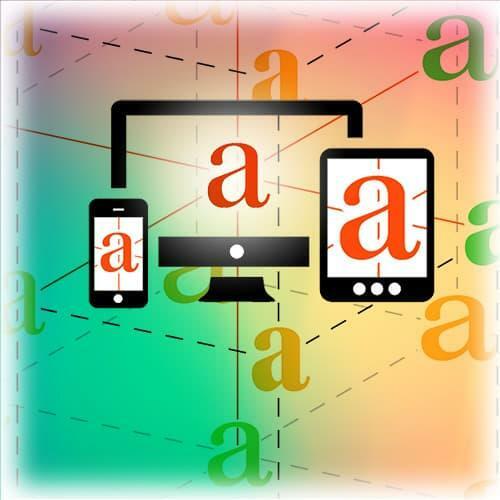 We now recommend you take the Responsive Web Typography v2 course. Web fonts have been around for a few years now, as has Responsive Web Design. But there are still lots of questions about performance, usability and consistency across browsers and devices. This course explores the world of web fonts and responsive type, what web fonts are, how they work and why you should be using them. Jason will be discussing how type can be a major supporting element with our design efforts on the web. He will be defining what Responsive Typography really means and how to implement it correctly. It’s a combination of art and technology. For many years, we have operated under assumptions of optimal screen resolutions and pixel-perfect designs. Freeing ourselves from these misconceptions is the first step in understanding what we can and can’t control. Responsive Typography is about Performance, Progressive Enhancement, Proportion, and Polish. Each font has a performance cost. You want to make sure you are only loading what you need. Proper implementation and performance will help avoid a FOUT (Flash of Unstyled Text). Jason explains how the Google Web Font loader can alleviate issues. Jason walks through a code snippet that uses the Google Web Font loader. He shows that while there’s a subtle change in the look of the page when the font loads, the overall experience is much better to the user. The key to the Google Web Font loader is setting “async” equal to “true” to unblock the loading of the page. Opentype fonts provide extra features that are available in the browser. For example, turning on ligatures adds a nice finishing effect to headings or other prominent text. Some features do add extra file size or download time so web designers still want to keep performance in mind when adding polish. Jason catches up on a large number of audience questions related to web font issues, web font licensing, and third-part web font vendors. Jason continues answering audience questions. Typography is the process of selecting a typeface for a design. More specifically, it’s choosing a typeface that best reflects your client or project. Jason discusses these concepts and gives some examples of how to select an appropriate typeface. Serifs, crossbars, stems, and eyes are just a few of the many parts of a typeface. Jason walks through the anatomy of a typeface and discusses how small details can make a big difference when it comes to feel and readability. He also explains a few of the different classifications outside of serif and sans-serif. My factors can influence the selection of a typeface. These may include tone, history, origin, and intended use. Jason demonstrates how he selects a typeface and how he searches for related typefaces based on keywords or designers. Type pairing is the process of matching two different typefaces that will be used together. This is useful when selecting fallback fonts. When pairing, you may match qualities (i.e. oval vs. round) or choose based on related histories or a common designer. Print typefaces are becoming more available on as web fonts. Also, many of the print techniques are possible with CSS. Jason talks about this trend and answers a number of audience questions before moving into a demonstration. Jason takes a look at how to transition print typography to the web. He stresses that OpenType features bring a little more finesse and have more options for fallback. His inspiration is the layout of an article in Vanity Fair. This example will be used later in the exercises. Progressive enhancement is the process of developing a great baseline experience for your users and building it up as they have additional capabilities. Enhancements to the design should follow the most important rule: Don’t block page render. Jason reviews a few of the performance points he discussed earlier. Being mindful of the size of your typeface library will lead to better performance. Choose our typefaces wisely and ensure you are loading them asynchronously so they do not block page rendering. Jason also gives a few additional progressive enhancement tips. In this exercise, Jason will be covering how to incorporate web fonts with progressive enhancement on the webpage. He begins by walking through the performance_start.html code then moves to show the final version. All code for this exercise is located in the 01_PerformanceProgression folder. Now that the web fonts are included correctly, Jason demonstrates how he tests the layout and makes corrections between the fallback font and the desired web font. He uses toggle buttons to turn on and off the web font and toggle his corrections. Jason answers a few audience questions about Exercise 1. He also shows what parts of the final code are the toggle buttons he uses for testing the web fonts so you can pull that code in and incorporate it into you own projects. Jason reviews the importance of proportion in responsive web typography. Adjusting the font sizes and line heights help maintain the meaning and relationships between headers, body copy, and other type styles. Building off the finished file for Exercise 1, this exercise adds media queries which will allow the text to proportionately scale as the viewport changes size. Jason spends some time answering audience questions about how to know what the optimal font size may be for a specific font. He also talks about using EMs in media queries. Jason begins with a brief overview of the polish that can be added to web typefaces. For example, when using OpenType fonts, ligatures, fractions, kerning, etc. are all features that enhance the look and have reliable fallback options. All these details make good reading experiences great. Jason demonstrates how modifying a link’s underline can add a tremendous amount of design polish. The trick uses a background gradient, which if unsupported, fallback gracefully to a regular underline. This exercise focuses on adding design details to the type from the previous exercises. Jason focuses on OpenType features like ligatures and kerning adjustments. He also demonstrates how to create columns and block quote styles. Jason continues his explanation of Exercise 3 by adding initial caps to the be beginning of the first paragraph. He also answers a few audience questions and debugs a couple other code issues. Before moving on, Jason discusses hyphenation and justification of text with CSS. He also answers a few last audience questions about font rendering differences between browsers and operating systems. Jason circles back to the Vanity Fair article and talks about designing the perfect page. He first shows how Vanity Fair transitioned their print article to the web. However, there is room for improvement. This exercise demonstrates how Jason migrated the Vanity Fair article to an impactful, responsive web page. Jason answers some audience questions regarding FOUTs and some issues at specific browsers sizes where text stacks or doesn’t wrap in an ideal fashion. Now that Jason has finished the formal content of the course, he moves on to a Q&A session with the audience. First, he talks about how and why he designed the columns to include a different margin than the overall article container. Jason addresses questions about handing high-resolution displays and how he’d modify the design. He also talks briefly about the use of grids and how he handles the look and feel of links. Jason talks about how designers and developers both need to understand the implementation of fonts and responsive layouts on the web to better grow communication between team members. A few audience members describe experiences working with designers and difficulties they’ve encountered when moving designs to the web. Jason shares his insights and gives suggestions on ways to make the workflow easier. Jason gives some of his opinions on libraries like FitText.js and how scaling fonts or using viewport units can lead to issues. He mentions there are times they work great, but he generally stays ways from them. Jason shares his thoughts on the cost of responsive designs. While designing a site responsively is more costly, there is added value with justifies that cost. Jason jumps around through a few online articles and other resources on type, responsive design, and information design.